What are the top business intelligence software companies in 2018? More businesses, big and small, are realizing the importance and benefits of having one of business intelligence programs in place, mainly gaining insights off their data. For a detailed look at these benefits you can check out our analysis on the 5 benefits of using business intelligence. With the increase in demand also comes the increase of vendors vying to provide their tools to your BI needs. Today, BI products are offered both by software companies purely developing BI products and IT vendors with a BI platform. For instance, the Big Four IT vendors—SAP, Oracle, Microsoft, and IBM—are dominating the business intelligence and analytics market share with their broad range of BI product portfolios. 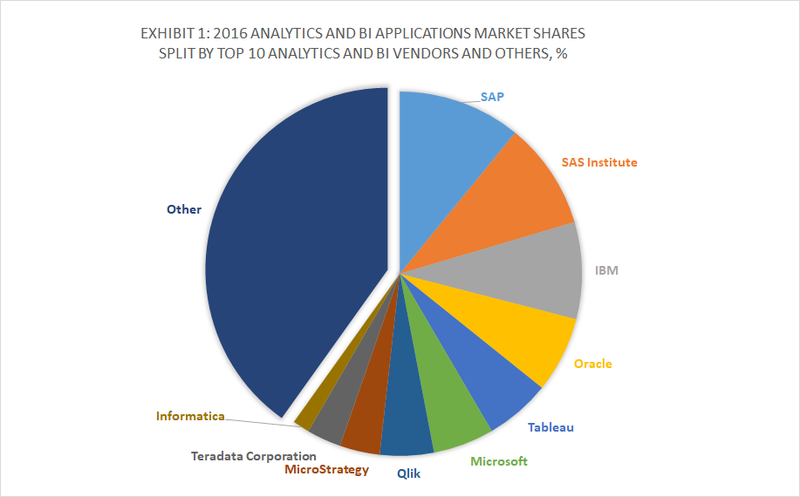 Top 10 business intelligence and analytics vendors based on market share in 2016. The Big Four consistently places in the top vendors according to their market share in the industry. In 2015 and 2016, the market leader was SAP. The vendors that followed include SAS Institute, IBM, Oracle, Tableau, and Microsoft in 2016, respectively. The leading vendors in the business intelligence and analytics market share. In the following year, according to the Statista report on “Market share of the leading business intelligence software needs, as of 2017,” SAP leads among BI vendors with a 16% market share. It’s followed by Oracle with 12% and SAS Institute with 11%. Meanwhile, IBM and Microsoft are in a tie with 9%. While the Big Four offer some of the most popular and widely-used BI products in the market today, they are not the only options available. In fact, plenty of smaller and younger vendors have emerged to offer tools that match, or even surpass, the bigger market players. Vendor experience. First of all, it’s important to know the vendor’s experience in delivering its capabilities to various or specific industries, business size, and niche. Experienced vendors are more aware of the common issues you’ll face and are better equipped in providing you with the right solution in a timely fashion. Pricing. Some companies are more expensive or more affordable than others. Beyond affordability, it’s vital to consider the vendor’s overall value and total cost of ownership. While others may look more inexpensive at a glance, the costs may add up with each additional upgrade. Meanwhile, other products, albeit they appear more expensive, may already include them in their offerings. Implementation speed. The duration ranges from a few hours to months. Factors such as the deployment model, the complexity of the project, the size of your business, the number of users and your existing infrastructure are only some of the things that contribute to the duration of the entire process. All things considered, it’s essential to choose a vendor that accomplishes this in a timely yet solid manner and within your required timeframe. Training and support. A key consideration that varies from vendor to vendor that makes or breaks the success of the BI system’s implementation. The vendors that made it to the list offer a rich set of training materials (ranging from video tutorials, how-to guides, support portals, knowledge base, documentation, FAQs, and whitepapers, among others) for their products. They can also be reached through various channels such as via phone, email, or live chat to request for support. Without further ado, let’s proceed with the list of business intelligence software companies. Sisense is known and considered as one of the leaders in business intelligence. It’s a business analytics software company founded in 2004 with products that specialize in the analysis of big data. It has both back-end and front-end for non-technical users to analyze large volumes of data sets from multiple sources powered by in-chip technology and for creating visualizations (such as reports and dashboards) on any device including mobile devices, respectively. Pricing: Sisense has an annual license model with custom pricing. With that, the cost of your subscription is priced specifically for your business based on the number of users, the volume of data, type of project, and timeline of the project, among others. Implementation speed: One of Sisense’s strengths is its fast implementation process. Setting up and deployment of the product are finished within a matter of days as there are no additional servers and hardware to set up. Why should you choose Sisense? Sisense has established its name in the BI world with its top-notch solutions where they garnered premier rankings in customer satisfaction. It’s easy to see why—Sisense is powerful. It handles all types and sizes of data. It’s highly scalable as your organization accumulates more data and its in-chip technology easily processes high volumes of data coming from various data sources so you won’t have to spend on additional servers and hardware. If you want to check its features prior to committing to a plan, you can easily do so when you sign up for a Sisense free trial here. Looker is one of the younger players in the BI market as it was only established in 2011. However, the vendor shows potential in quickly adapting to their customer’s needs and catching up with their more established competitors. With a core mission of providing access to consistently defined data to everyone in your organization, even the average business user can use its product with ease and explore data in varying levels of details. Pricing: Looker provides a custom pricing structure based on your number of users, the scale of deployment, and database connections. This is to ensure you get the right features you need for your business. Implementation speed: Using a modern approach, Looker can deploy the platform in hours as it’s browser-based and installed within your existing infrastructure. Depending on your preference, you can host the platform on Looker’s server or your own server. Why should you choose Looker? If you’re looking for a pared-down yet robust interface, Looker is a great choice for your needs. Its browser-based big data interface operates in the database completely to deliver analytics to both non-technical and more advanced users. It also has a proprietary data modeling language and quick implementation. The vendor offers an attractive demo. Simply sign up for a Looker demo here. Infragistics is a global software company founded in 1989 that focuses on UI (user interface) development tools. In addition, it also branched out to application prototyping industry, developer support, and UI and UX training and consulting, among others. It has a robust BI product called ReportPlus that enables you to visualize your KPIs with real-time dashboards and rich interactive reports. Pricing: Infragistics’ ReportPlus is available in two subscription models starting from $99.99 per user per year for the Server and Desktop-and-Mobile editions. There’s also an annual server fee of $5,000. Implementation speed: The timeframe is dependent on your chosen deployment method which can take from days to weeks. Why should you choose Infragistics? Its BI service specializes in business analytics and data visualization where it’s considered as one of the best-of-breed software in its niche. It lets you create, access, and share interactive dashboards and visualizations in the touch-enabled app and drag-and-drop features on any device with true self-service BI. You can easily sign up for a ReportPlus free trial here. Qlik is a pure BI vendor founded in 1993 with products for business intelligence and visualization. Its main product, QlikView, is used for self-service BI reporting, visual data discovery, and data dashboards creation and sharing. The other offering is Qlik Sense for a more free-form analytics where you can develop data and web connections with API connections. Pricing: Qlik’s products start with free editions for basic or personal use. It has scalable subscription models starting from $15 per user per month and licensing options which are available on request. Implementation speed: Personal edition products can be downloaded from Qlik’s website immediately. Meanwhile, three main phases are performed for Qlik’s product deployment for enterprise editions, hence, it may take a few weeks to complete. 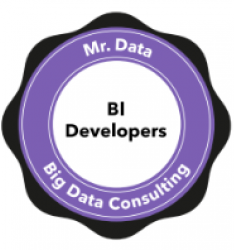 It has two reliable BI products to match your business intelligence needs. Qlik focuses on harnessing human intelligence and using BI tools to amplify it. With that, it’s an effective solution for self-service data visualization, embedded analytics and reports, and guided analytics apps, among others. SAP is a Germany-based multinational software corporation founded in 1972 that develops enterprise software for handling business and customer relations. It’s the world’s largest software developer and the third-largest independent software company by revenue. The giant IT vendor offers a broad range of BI products that led the company to dominate the BI and analytics market over the years. The company’s BI division is called SAP BusinessObjects which is a suite of front-end applications for accessing, viewing, and analyzing BI data. Pricing: The licenses of SAP’s products have pricing variations due to their different inclusions and offerings. For instance, cloud-based products, such as SAP Analytics Cloud, start from a subscription of $24/user/month. Implementation speed: Depending on the product, SAP’s BI applications can be implemented fairly quick in just a few weeks instead of months for cloud-based and on-premise implementation models. Why should you choose SAP? SAP holds the biggest BI market share because of its wide range of effective BI solutions aimed towards various industries and company sizes, from SMBs to large enterprises. On top of its wide array of other solutions that you can seamlessly connect with your BI platform, SAP’s BusinessObjects products work with multiple data sources in different formats making it a broad and robust BI solution with a self-service functionality. Tableau Software is a BI company founded in 2003. Its product, available in Desktop, Server, and Online, focuses on interactive data visualization. In addition, Tableau offers two more products to simplify BI for free: Tableau Mobile (free Tableau Online/Server mobile companion) and Tableau Public (free Tableau Desktop/Online version). Pricing: The pricing of Tableau’s products are subscription-based. It comes with a per-user monthly fee paid annually starting from $35/user/month. Enterprise licensing is also available. Implementation speed: The timeframe of implementation mostly depends on your organization’s size and deployment method. For instance, it has a Quick Start Service: a 4-day server implementation timeframe for SMBs, 2 days for out-of-the-box server deployments, and 2-hour increments for the desktop version. Meanwhile, enterprise-level deployment comes in four phases. Why should you choose Tableau Software? The products of Tableau Software are robust in drilling down data and visualization for any types of users. It’s also built for querying various database types and constructing visualizations from the results. This can then be read in a variety of forms (i.e. maps, bar graphs, and pie charts) to leverage data discovery and understanding. Developed by SAS Institute, SAS is a software suite for business intelligence, advanced analytics, predictive analytics, and data management. It was originally developed from 1966 to 1976 and then further developed during 1980s and 1990s. Its collection of products mine, modify, handle, and retrieve data from various sources and then perform statistical analysis. Pricing: SAS products are offered in custom pricing schemes to match the requirements of different types of users. The licenses are offered to enterprises, SMBs, individuals, academics, and government. Implementation speed: For the full deployment including training, the process may range from weeks to months. Why should you choose SAS? It’s an established company in the BI market. With various modules included, it offers an integrated suite for discovering and collecting enterprise-level data. It integrates with Microsoft applications and includes real-time analytics. One of the Big Four, Microsoft is a popular, established name in the IT industry. This multinational tech company is a developer and manufacturer that supports, licenses, and sells a variety of services, consumer electronics, and computer software, among others. It holds one of the largest market shares in the BI world with its array of products. Pricing: Microsoft’s products are available in subscription-based models, per-node, per-month capacity pricing, and volume licensing and hosting. There are also free plans available for some products, such as the Power BI Desktop edition. Implementation speed: For Power BI, implementation is quick and easy. You just have to sign up for an account and download the software. Why should you choose Microsoft? Microsoft is a familiar name in many households and organizations. With that, it’s reliability and performance has been proven over time. When it comes to business intelligence, its product, particularly Power BI, is a robust visualization tool with a direct integration with Excel and various other data sources. It provides great data visibility and correlates disparate data. IBM is another giant IT vendor and member of the Big Four. IBM itself is a century-old corporation that’s, based on employee number, recognized as the second largest US firm. It entered the BI industry after purchasing Cognos in 2007. Cognos, before it was acquired by IBM, has been around for years developing BI solutions for LAN. After its acquisition, IBM Cognos quickly rose as a BI mega-vendor following the merge of their tech. Pricing: The product is available on various plans. It starts from $1,990/month, $10,000/month, and $19,950/month for Workgroup, Standard, and Enterprise plans, respectively. The vendor also offers custom pricing. Implementation speed: The process and timeframe can vary based on company size and requirements. Why should you choose IBM? IBM Cognos has various components and over 30 products for dashboarding, reporting, data integration, and business intelligence. Its market edge lies on its flexibility to support the largest corporate giants and SMBs at the same time. The apps can be used with relational and multidimensional data sources from a wide range of vendors such as Microsoft and Oracle, among others. Infor, a multi-national enterprise software company, acquired Birst which is a startup company with a SaaS delivery model for business intelligence to administer big data integration and customer analysis in 2017. Founded in 2004, Birst is considered a young player yet it has proved to be a reliable BI solution with easy-to-use tools and robust features. Pricing: Birst comes in custom pricing, hence, a quote is required for your organization’s information and requirements. Implementation speed: While dependent on your company’s scale, the implementation process of Birst is fairly quick due to its cloud architecture. Why should you choose Birst? Birst has self-service analytics, visual discovery, mobile tools, and a robust automated data refinement feature that are offered at an overall low cost of total ownership. It has end-user self-service and enterprise-grade scalability. Domo, a computer software company founded in 2010, develops business intelligence tools and data visualization services. This vendor is funded by an A-list of investors, angels, and CEOs of the world’s biggest Internet and SaaS businesses. It’s founded by a team of talents from various industries such as Google, LinkedIn, SAP, Facebook, and Amazon, among others. Pricing: Domo offers a subscription-based pricing for its three plans starting from $83/user/month. Implementation speed: Since it’s a cloud-based solution, Domo’s implementation process is shorter. It can take up to one to two months or even shorter based on your company’s requirements and scale. Why should you choose Domo? Geared towards executives and CEOs in various industries, Domo is a reliable choice in building a digitally-connected organization. It shines in enabling users to access information and reports from a single platform and connecting data with a wide array of connectors. GoodData was founded in 2007 by NetBeans and Systinet founder and CEO Roman Stanek. It delivers an end-to-end cloud analytics for companies of all data enterprises. The platform helps users produce on-demand reports by aggregating separate data sets and putting them together. Pricing: With a custom pricing scheme, requesting a quote is necessary for the vendor to know your organization’s needs. Implementation speed: The process is shorter than the traditional BI systems as it’s a Platform-as-a-Service solution. An implementation-dedicated course is also given to users as part of training. Why should you choose GoodData? GoodData offers a unique solution that’s available as a PaaS through the vendor’s cloud-based Open Analytics Platform. The system gives your IT data governance for infrastructure maintenance and security while non-technical users get autonomy for building reports and dashboards. iDashboards is a tech company with software-based BI dashboard solutions. It offers a fully-customizable data management and visualization tool with a cloud-based version and supplementary visualization tools to support its primary products. Pricing: The pricing model of iDashboards is dependent on your company’s requirements and structure, hence, it only provides custom pricing. Its product always includes unlimited dashboards and data connections, custom reports, and real-time alerts. Implementation speed: iDashboards is installed as a web server which means its implementation time only takes a couple of days to, at most, weeks. Why should you choose iDashboards? iDashboards is known as a cost-effective alternative to other BI products due to its offering of a low cost of total ownership and licensing. It also has a fast-paced mechanism for transforming data into interactive dashboards with just a few clicks. Chartio is a BI company that’s fairly young. With that, its offerings are not as advanced or complex as more established BI solutions. That’s why its market is mostly geared towards startups and SMBs with limited budget and accelerated growth, where they shine on their BI solutions. Pricing: Chartio’s product price point is based on your company size. Implementation speed: Without required hardware, deploying Chartio only takes a few clicks as it’s a cloud-based application. Why should you choose Chartio? If you’re a startup or small or medium-sized business owner with a limited budget, Chartio is a reliable option that offers cloud-based data exploration for both users with less BI experience and more seasoned analysts. The interface is simple yet comprehensive for data analytics. Attivio is a software company founded in 2007 that develops solutions for data analytics and access. AIE (Active Intelligence Engine), Attivio’s flagship product, is developed to merge data warehousing, analytics, query, and business intelligence for an all-in-one data solution. It also has an embedded version to embed the same functionalities on a variety of business applications. Pricing: Attivio only offers custom pricing as per organizations’ needs. Implementation speed: Tagged as an easy-to-deploy solution, Attivio’s length of deployment varies on various factors such as the size of the project and the security requirements. This can range from a few weeks to a few months. Why should you choose Attivio? It’s a strong choice if you’re looking for a BI solution that focuses on natural language processing and AI-powered search and text analytics. Its focal point on utilizing artificial intelligence makes it stand out from its competitors. Oracle, a member of BI market’s Big Four, is an IT vendor with a BI platform. It’s the second largest software maker based on revenue. The Oracle Business Intelligence offers a portfolio of applications that pioneered the integrated, end-to-end Enterprise Performance Management System. Pricing: For Oracle’s Business Intelligence Cloud Service, the product is offered on a subscription model for $150/named user/month. Implementation speed: Depending on end-user requirements, deployment can take weeks or months depending on the project’s complexity. Why should you choose Oracle? Oracle is indisputably a reliable and robust vendor of BI solutions with its arsenal of software products for the niche. It’s an all-in-one solution with big data capability for various purposes ranging from future planning to setting and tracking specific goals. An Australian-based multinational BI vendor, Yellowfin offers a product that specializes in analysis, reporting, and sharing. It was founded in 2003 with a product that emphasizes on keeping it simple and open for the lay-user. Pricing: Yellowfin’s products are offered in enterprise licensing from a free plan up to $1,750/year for 5 users, and a custom pricing for enterprises. Implementation speed: The deployment length of Yellowfin only takes up to hours and days. Why should you choose Yellowfin? With ease-of-use as its priority, Yellowfin is a good choice with its more than 50 data visualization types, ad-hoc analysis, and location intelligence functionality. While not as popular as other products, its offerings are more than sufficient for common BI requirements. Founded by a team of engineers in 2012, ThoughtSpot is a tech company that creates BI analytics search software. Its main product is a search and AI-driven analytics platform which specializes in performing a search to access and analyze data in seconds. Pricing: Based on data capacity requirements, ThoughtSpot has subscription pricing for Enterprise and Extended Enterprise with unlimited users. Meanwhile, scaling out is in 250GB increments. Its pricing information is available by quote. Implementation speed: Available as an on-premise or private/public cloud, deployment and implementation of ThoughtSpot ranges from two to four weeks. Why should you choose ThoughtSpot? ThoughtSpot specializes in enabling analytics at a “human scale,” hence, it’s a good choice for non-technical users. It also works like a search engine where users type in key terms in a search box and get results of matching visualizations to simplify analysis of data, creating reports, and building dashboards without the help of an IT specialist. Pentaho is a company that develops business analytics support software. While it has an array of applications for data mining, data integration, and data access, among others, its core product is the Pentaho Business Analytics Platform. The company was founded in 2004 and released their BI suite a year later. Pricing: Pentaho has a subscription-based, flexible pricing model that’s only available on a quote request. The enterprise-class plans are priced based on your needs. Implementation speed: The deployment process is guided by Pentaho’s team to ensure the implementation is finished quickly and correctly. Why should you choose Pentaho? Pentaho is considered as the first vendor to market direct reporting for NoSQL. It’s also a reliable solution for combining data integration and analytical processing. The unification of end users and IT makes for an easy and effective information visualization and integration. New York-based company Clear Analytics touts over 20 years of expertise in helping businesses self-sufficiently leverage the power of business intelligence to identify risks and opportunities in the industry. The team’s Clear Analytics platform is mainly designed as a self-service analytics platform where users can extract large data from various sources with minimal friction and help users produce comprehensive excel reports with ease. Pricing: The pricing of Clear Analytics is only available by quote from the company. Implementation speed: Being a cloud-hosted platform, it can be quickly implemented and utilized to extract data and generate reports. Clear Analytics was also designed to help businesses acquire insights and access key data without relying on IT teams. Why should you choose Clear Analytics? The product makes it easy for businesses to extra large amounts of data from various sources and store them on a centralized platform, allowing teams to accessibly utilize key metrics. Basically, you will no longer have to request your IT multiple times to gain access to relevant data. Creating excel reports is also a breeze, even for novices. In this article, we compiled a list of business intelligence software companies that are worth looking into as you start your search for the right BI tool. Knowing your vendor is crucial as they are the ones to deliver the features, support, and upgrades you need. The list includes both vendors with only BI products as well as IT vendors with BI platforms, including the Big Four in the business intelligence and analytics industry. Lastly, if you’re a newly formed company and wondering if BI software is for you, you’ll be surprised at the many benefits of BI software to a startup.